A spin on fuel filter that is suitable for most inboard and outboard petrol engines. 25 micron filter separates water from fuel and removes impurities. Filter features a metal shell that is over 50% thicker than conventional filters. Durable paint finish to resist corrosion - even in saltwater environments. Epoxy coated internal surfaces that resist rust caused by water captured within filter. 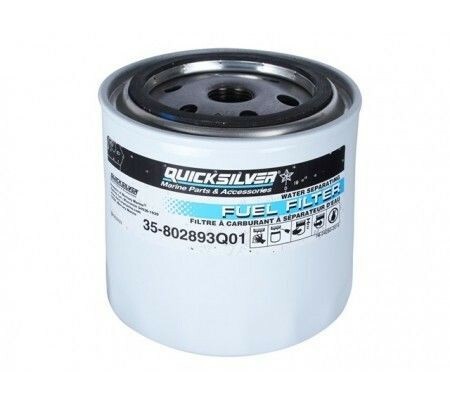 Fits all Mercury MerCruiser applications except 1992 4.3L Generation II engines with an in-line fuel filter. Also fits Yamaha,Suzuki SMI, Volvo Penta and other filter heads.